A passion for Beautiful Things: OH! I want to sit down!!! Good day dears!!! I am normally crazy about anything that's sweet and romantic, soft colors and relaxed looks... the 'home' feel.... and I don't often find myself attracted to minimalist elements, but some designers / architects have done some amazing things, that even though they were done years ago, they still remain fresh and modern. 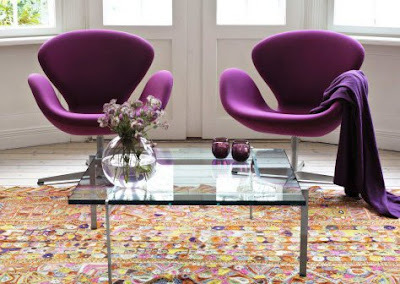 I am a big fan of Arne Jacobsen's chairs, and the other day, checking out one of my favorite sites www.trendir.com, I found some truly beautiful examples of Jacobsen's fine work. 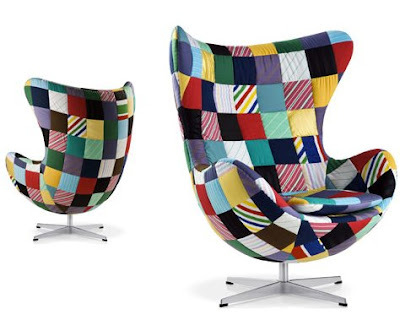 Here is the Swan chair in one of its most beautiful presentations and bellow the Egg chair with a really funky twist. LOVE'em!!! Hi Nuit! Thanks for all your comments on my site =) I love the shape of these chairs. So stylish! Purple is such a regal color!